Marketing automation has moved from buzzword to industry standard on the road to becoming ubiquitous in all walks of business. 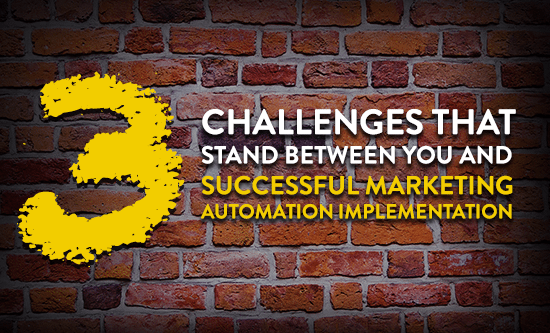 It’s safe to say that marketing automation is here to stay. However, despite its popularity, many marketers around the world are stumbling time and time again when it comes to effective and successful implementation. According to Ascend2, 51% of marketers consider their marketing automation implementation somewhat successful at achieving important objectives, while another 16% still struggles to achieve success. To help shed some light on this issue, we’ll unpack three of the most common under-the-hood challenges and offer tips on how to overcome these hurdles. Whilst it sounds simple enough, surprisingly this is one of the most common points where marketers struggle. Eager to commence, they jump the gun by beginning implementation prematurely and creating their campaigns before placing enough thought behind who it is they’re targeting, or even how and why. As a result, marketing automation has quickly become an enabler of automated broadcast emails and is talking to everyone at once, but no one in particular. Make sure to take a step back and consider what you want to accomplish before diving in unprepared. Leading change efforts across the whole organisation is no easy task, that’s for sure. Aligning marketing strategy with internal processes is often a delicate balancing act that creates push backs between marketers, IT managers, analysts, and other stakeholders. What’s important here is continually addressing the value that marketing automation brings in order to receive ‘buy in’ from all sectors. You can’t push forward if you give in to those who push back. To get there you need all the help you can get, and experienced partners who assist in this journey can lift a huge weight off your shoulders. It’s easy to over-rely on your shiny new marketing automation tool as it becomes part of daily office life. Make sure to see it for what it is—an enabler, a tool to help you scale and bring you closer to the people you want to reach (not the other way around). Undoubtedly there will be hiccups that occur along the way: change doesn’t happen overnight. There is an ongoing need for input and participation to ensure the shiny tool provides ongoing value. Implementation is only the start. And guess what? It’s up to us marketers to lead the way and set the standard. It’s a journey on which you need to make sure you get enough support along the way if you’re going to get to where you want to be. We hate to be the ones to break it to you, but there’s no easy way out when it comes to implementing marketing automation. If there was, anyone could do it. And they would be doing it well. There’s no silver bullet—if anyone tells you otherwise, or that there’s a quick fix, be very wary and keep your eyes wide open if you want to avoid falling victim to the siren song. You don’t want to be the one left stranded, staying back late at night trying to make it all work.